If you love the satisfaction of making your own wreath, but don’t want anything complicated, this is for you! Make this wreath using only three items in about 10 minutes. 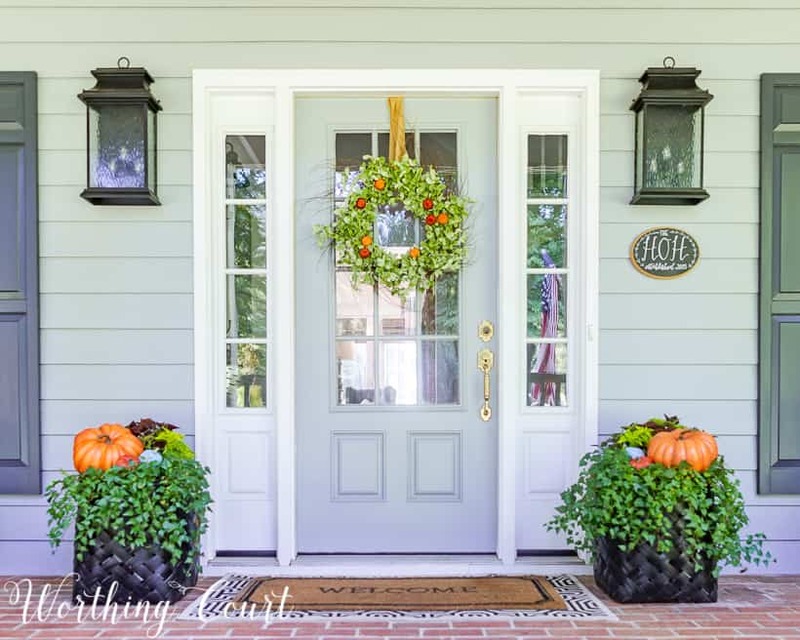 After sharing my ‘just enough’ fall front porch earlier this week, many of you expressed an interest in knowing how I made the wreath on my door. Well let me tell ya – it has to be the easiest thing ever! I literally knocked this thing out in about 10 minutes – maybe less. Let me show you how I did it. 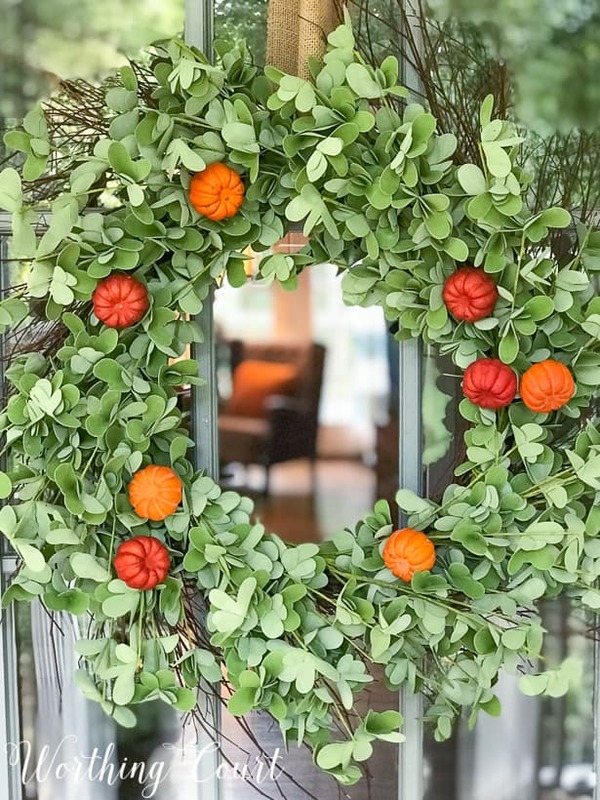 Lay the eucalyptus wreath on top of the grapevine wreath. Be sure sure to position the two wreaths so that the opening in the middle of both wreaths lines up. 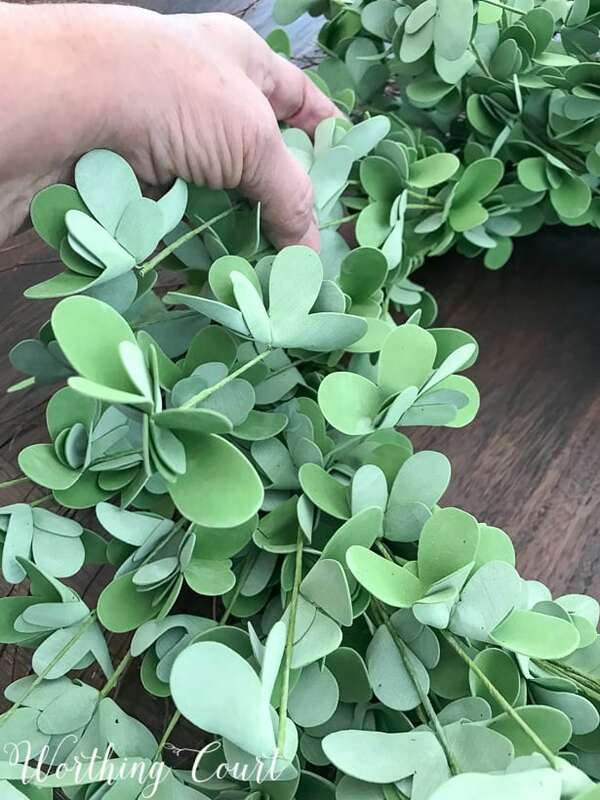 Fluff the eucalyptus wreath to give it more dimension. Straighten (if necessary) and slightly pull the stems forward so that the wreath isn’t flat. 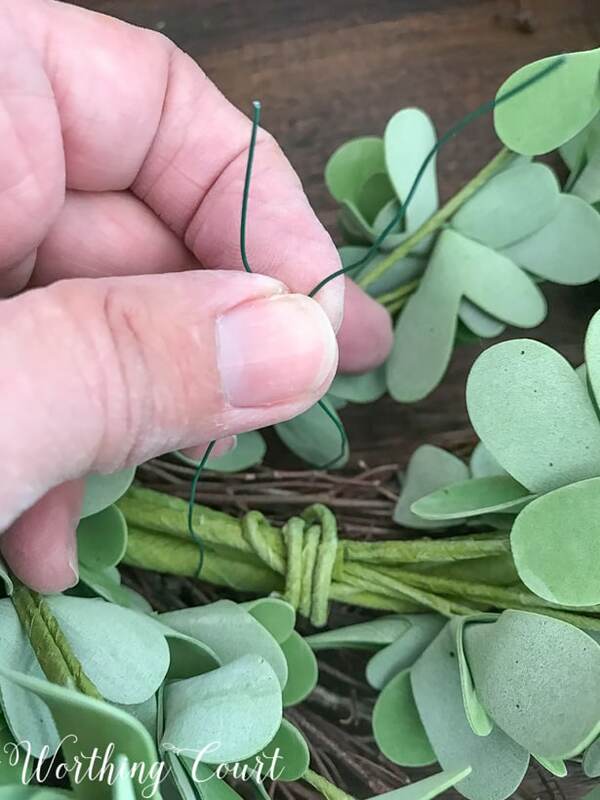 Wire the eucalyptus wreath to the grapevine wreath, by weaving a cut piece of florists wire through the stems of the grapevine wreath and twisting the ends around the eucalyptus wreath. 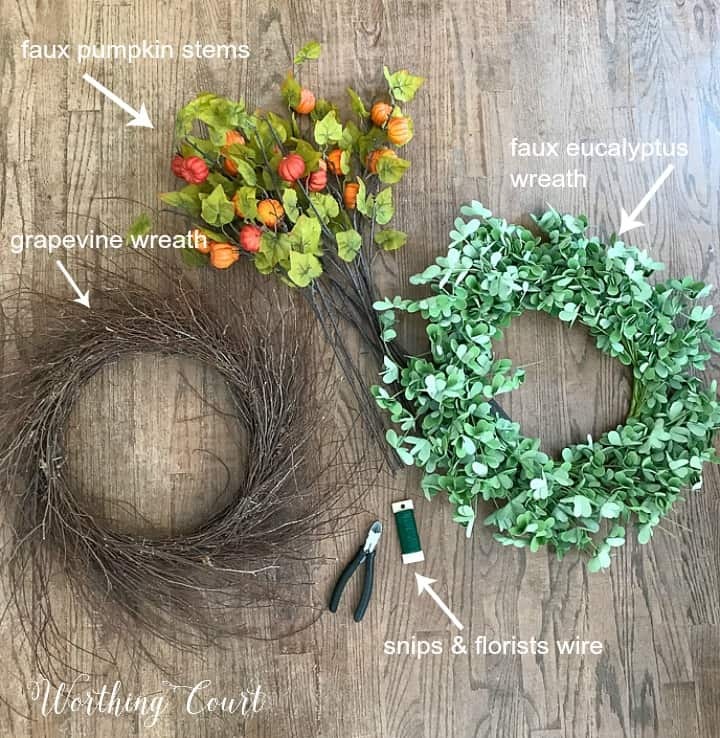 Be sure to place the wire so that it will be hidden by the foliage and tuck the cut ends into the grapevine wreath. 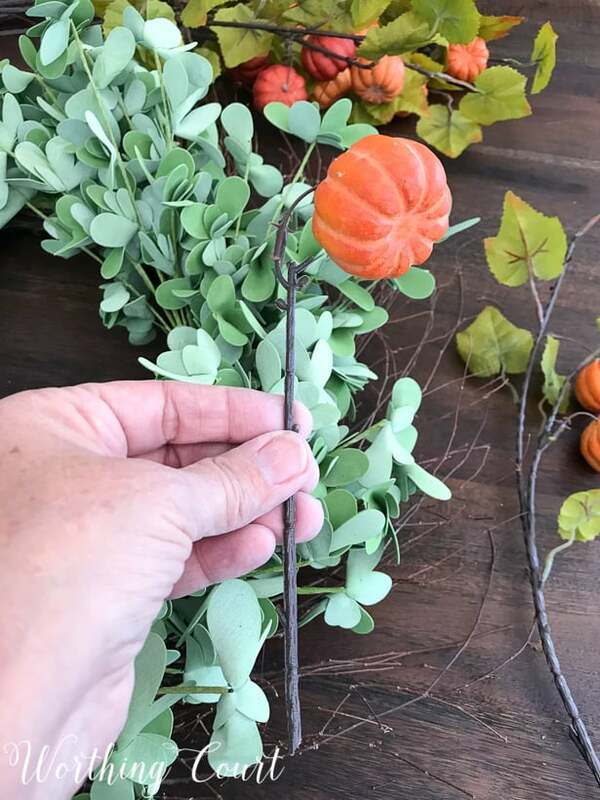 Cut the pumpkins from the stems, leaving a part of the stem attached to the pumpkin. 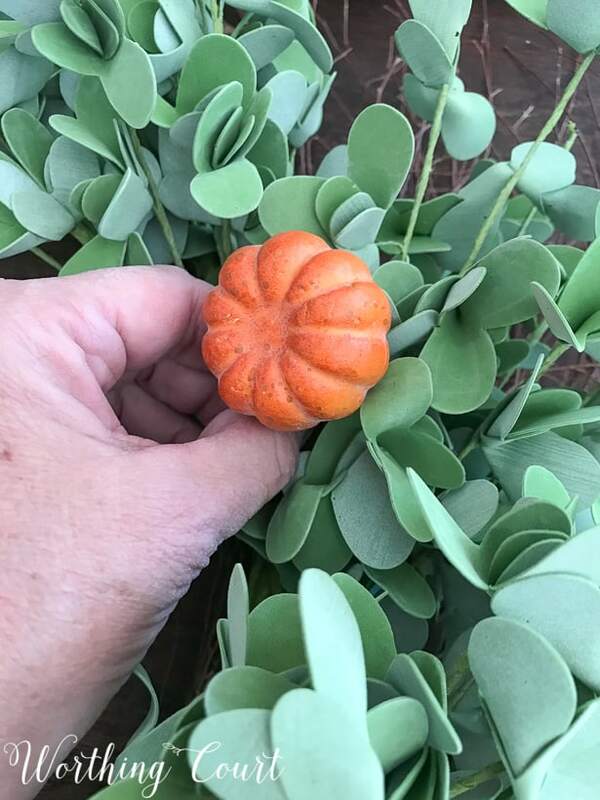 Tuck a few of the pumpkins into the stems of the grapevine wreath until secure. Add as many or as few pumpkins as you would like. I was going for a simple, understated look, so I only added a few. I think it looks so pretty hanging from a strip of burlap ribbon on my front door! CLICK HERE TO SEE MORE OF MY FALL WREATHS! AND CLICK HERE TO TAKE A TOUR OF THE ENTIRE PORCH! Pretty….where did you get your eucalyptus wreath?? Thank you, Angie! The eucalyptus wreath came from Hobby Lobby. Just what I was going to ask. Thanks! It is very pretty. BEST fall front porch EVER!!!! 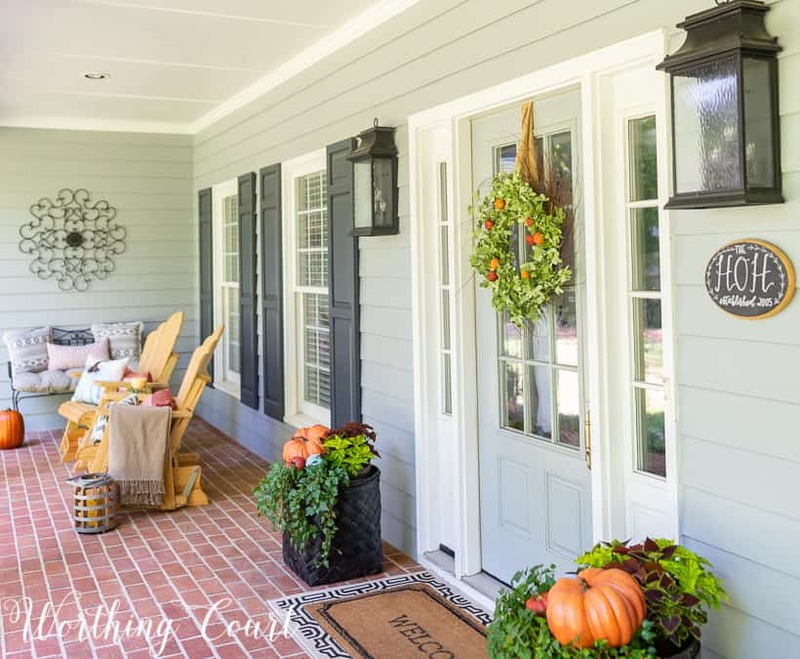 I look at many decorating blogs and your porch is elegant, understated and stunningly FALL…. love it!